Take your photo (and pdf passport copy) before applying for the Indian Visa to save time and make life easier for yourself . It took over 3 & 1/2 hours to complete the online Indian Visa application. Taking and uploading the photo for the Indian Visa and copy of passport in pdf format was the most time consuming. In hindsight I could have completed in stages – and had both the photo and passport pdf ready before i started filling in the form. This was not advice given by the online visa website. Follow the the info below in this blog to help you to take the passport photo in the required format prior to filling in the application form. For the PDF copy of your passport follow the link at the bottom of this blog post. 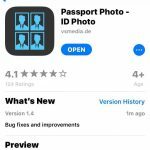 Taking the square passport photo required for the Indian Visa application is easy and straight forward using the free app – pictured below – which will give you the option of taking a photo with dimensions specificaly for India. Do this with your phone and then send to your laptop – I did this by sending it to myself via Facebook messenger and then downloading it to my laptop. It’s much easier to fill the form in on your laptop as it is really hard to see and navigate the huge form on your phone as it is a large form and not particularly phone friendly. To use the APP – you simply chose the country for which the passport photo is required for – in this case India – and then take a photograph of yourself . The App makes sure it is the correct size. Save the photo. And thats it. I purchased an neck pouch passport holder – the one in the link above – as I was constantly showing my passport at the airports and it’s a lot easier to have it easily to hand rather than in a bag. I chose a RFID blocking passport holder for extra security and I strongly advise you do too. The Radio Frequency Shielding Material will block any attempts to steal passport data stored in the microchip in your passport and for extra security you can also store debit/credit cards in there for the same reason. Contactless credit and debit cards have RFID chips embedded in the card which can be read by fraudsters standing next to you with RFID readers. The last thing you want to have happen to you at any time but particularly when you are off on your travels.